The Carl Vinson Carrier Strike Group reported for duty Wednesday in the U.S. 5th Fleet area of responsibility in the Mideast as airstrikes continued in Iraq and Syria. The U.S. Central Command said Tuesday that American and partner-nation fighter and bomber aircraft conducted 22 airstrikes against the Islamic State of Iraq and the Levant, or ISIL, terrorists. 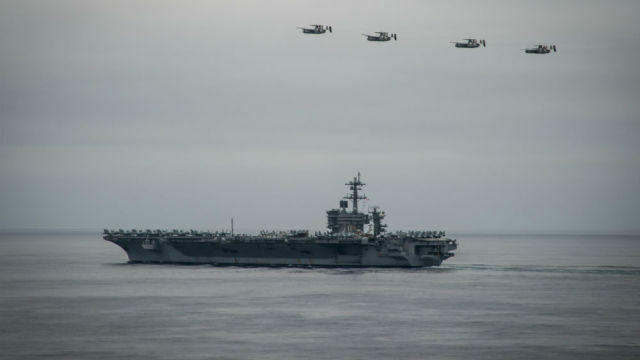 The strike group consists of the nuclear-powered USS Carl Vinson, its air wing, the guided-missile cruiser USS Bunker Hill and guided-missile destroyers USS Gridley, USS Sterett and USS Dewey. On the way to the 5th Fleet area of responsibility the strike group took part in Valiant Shield 2014, which was a rare opportunity to conduct integrated joint training exercises with two carrier strike groups. Valiant Shield involved 19 ships and more than 200 aircraft from Carl Vinson and George Washington Carrier Strike Groups, the U.S. Marine Corps, and U.S. Air Force. The strike group deployed from San Diego Aug. 22 and recently completed a port visit to Singapore, Oct. 7. During the port visit, the Carl Vinson hosted a reception in conjunction with the U.S. Embassy Singapore for local and regional dignitaries, and Bunker Hill held a change of command ceremony during which Capt. Sterling Dawley relieved Capt. Yvette Davids.